Our service is second to none, and our prices are very competitive for both hearing aids and hearing aid batteries. We also offer in-house repairs for $25.00 and estimates for "all make" warranty repair with our major manufacturers. Working within the medical community, we offer full physician and insurance cooperation. Our clinic fits and programs sophisticated hearing aids and related accessories, including Bluetooth connectivity, to suit all types of hearing losses and lifestyles. All of our diagnostic hearing evaluations are conducted by Doctors of Audiology who are very skilled in helping you choose the level of amplification that would best fit your hearing loss and your budget. We are one of the very few private practice Audiology clinics that also offer services for Cochlear Implants for those whose hearing is too bad for traditional hearing aids. We also actively participate in the prevention of hearing loss through the fitting of hearing protective devices and noise awareness education. We also supply musician earplugs and swimmers’ ear plugs. Please feel free to contact us for a free consultation on the effects of noise on hearing or with your hearing loss questions. We specialize in second opinions! We also love presenting on hearing-related topics for group education. Please contact us if you are looking for presenters for your upcoming event. Download our consumer's guide to hearing aids and make informed decisions on the purchase of your next hearing device. We answer some of the most commonly asked questions regarding hearing care services and hearing products. Take your hearing health seriously! Complete our survey to access your hearing health needs today! Our clinic fits and programs sophisticated hearing aids and related accessories, including Bluetooth connectivity, to suit all types of hearing losses and lifestyles. 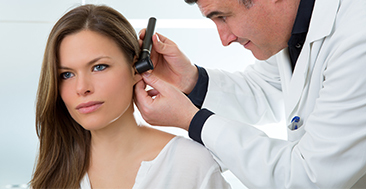 All of our diagnostic hearing evaluations are conducted by Doctors of Audiology who are very skilled in helping you choose the level of amplification that would best fit your hearing loss and your budget.